The valley of the River Porter, north-west of Sheffield city-centre, has a succession of water-powered industrial sites in varying degrees of preservation. It’s easy to explore, because the valley forms part of the fourteen-mile Sheffield Round Walk, and there are bus routes running parallel from Fulwood to Hunters Bar. A good place to start is Forge Dam, where on the site of a former forge and rolling mill there is a celebrated café which has changed little since at least the 1950s. Further downstream is the water-powered Shepherd Wheel, a surviving grinding shop (known in Sheffield as a “hull”) for sharpening knife blades, named after the late-eighteenth century tenant. Because the Sheffield craft trades were highly fragmented, many craftsmen worked for themselves, and were known as the “little mesters”. The grinders would hire a grindstone on an hourly or daily basis, rather like hairdressers and tattooists rent their chairs nowadays. They sat aside a saddle, called a “horsing”, bending over the millstone-grit grindstones that spun fast on the power that came from the water wheel. When you step into either of the two hulls (set opposite each other to take power from the two sides of the waterwheel), it’s easy to sense the dark, cold, damp atmosphere. Working in such places was not fun. Indeed, it was frequently lethal. Undetectable imperfections in the grindstones could at any moment cause an explosion throwing the stone and the grinder sitting astride it right across the building, into the roof or on to the unprotected cogwheels. “Wet grinding”, where the stone sat in a bath of water so that the dust was converted to a viscous mud, called “swarf”, was less profitable than “dry grinding”, which created so much iron and sandstone dust that grinders rarely lived past their mid-thirties if they persisted in the trade, as many did for lack of choice. The surrounding stretch of the valley became a public park in 1900, and when Shepherd Wheel closed in 1930 it was left almost entirely intact. It took many years, however, for the place to be restored. It first opened to the public in 1962. It is now vested in the Sheffield Industrial Museums Trust, which also operates the Abbeydale Industrial Hamlet and the Kelham Island Industrial Museum. It is open at weekends and bank holidays: http://www.simt.co.uk/shepherd-wheel-workshop. Shepherd Wheel is included in the itinerary of the Sheffield’s Heritage (October 2nd-6th 2017) tour. For details, please click here. This entry was posted in Sheffield's Heritage on November 24, 2016 by Mike Higginbottom. 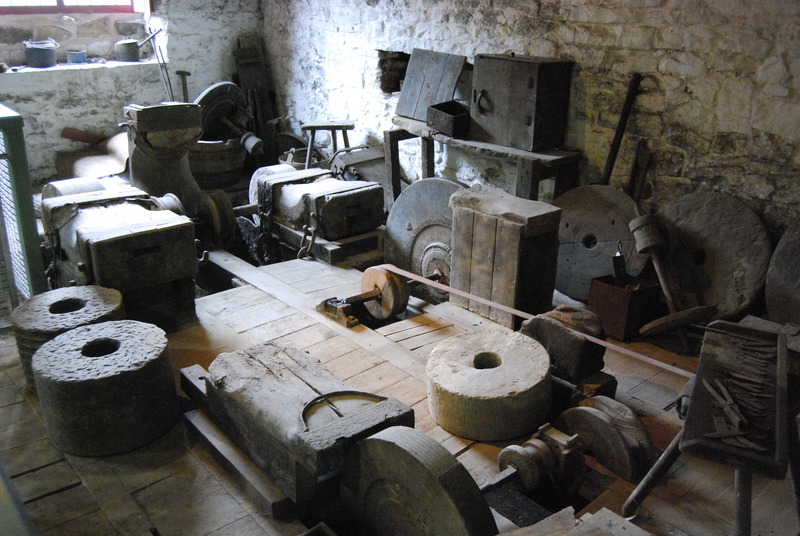 Sheffield’s Abbeydale Industrial Hamlet museum illustrates the entire history of the city’s traditional metal trades on a single site. Before the railway came and made possible Sheffield’s heavy steel industry in the East End, the manufacture of cutlery and edge tools took place on the fast-flowing river valleys of the Don Valley, mainly to the north and west of the town itself. Only with the arrival of steam power did the “little mesters” begin to concentrate their works in town. The Abbeydale Works can be traced back to at least 1714, perhaps to the “New Wheel” mentioned at the site in 1685. The present buildings date from the late eighteenth and early nineteenth centuries, and show the full range of processes involved in producing edge-tools using the crucible steel methods developed by Benjamin Huntsman in 1742. The Abbeydale works made scythes in a sequence from the manufacturing of clay crucibles, the furnace, to the forging and grinding, boring and setting of scythe-blades ready for the handle to be fitted elsewhere, laid out logically around a spacious courtyard. The vernacular buildings, including the workmen’s cottages and the Manager’s House of 1838, all built of local sandstone, sit easily in the wooded landscape, and it’s possible to forget the large millpond behind, holding back a placid-looking, prodigious weight of water that provided power for the works. The waterwheels, tilt-hammers, blowing-engine and grindstones show that, because materials were simple and technology primitive by modern standards, the high level of precision and workmanship achieved in the trade depended on the skill and physical hardiness of the craftsmen who worked here. For all its peaceful, rural setting, the site also recollects the “Sheffield Outrages”, a series of terrorist acts by which trade-union members sought to intimidate non-members by sabotage and violence. In November 1842 an explosion in the middle of the night destroyed the grinding shop and practically immobilised the works, presenting, according to the Sheffield Iris, “a scene that is rarely witnessed in a country not at war”. The manager, Mr Dyson, had employed two workmen “who, though industrious and efficient workmen, did not belong to the union, and therefore Mr Dyson came under the displeasure of the men who compose the committee appointed by the union”. Twenty years later, a subsequent tenant, Joshua Tyzack, was shot at: the fact that the only casualty was his top hat didn’t make the incident any less threatening. Tyzack, Sons & Turner finally closed the works down in 1933, and two years later the charitable trust set up by the Sheffield philanthropist J G Graves purchased it complete and largely intact. Indeed, the works briefly resumed during the Second World War. In 1964 the Council for the Conservation of Sheffield Antiquities began to investigate and restore the site, and since the 1970s it has been a popular tourist site as well as an invaluable educational resource. Abbeydale Industrial Hamlet is a destination in the itinerary of the Sheffield’s Heritage (October 2nd-6th 2017) tour. For details, please click here. This entry was posted in Sheffield's Heritage on November 14, 2016 by Mike Higginbottom. Years later, preparing a Birmingham’s Heritage tour, I wandered into All Saints’ Church, Small Heath, and eventually realised that this was the church in question. In fact, it’s a model conversion that retains most if not all of the original features, radically reordered to suit modern worship needs. The Victorian Society lost that particular case, but the building still stands, recognisably intact, and continues its Christian mission in what is now a predominantly Muslim area. I took my Yorkshire Mills & Mill Towns tour-group to Saltaire, for lunch at what was then the Vicars Café Bistro (now the Saltaire Canteen). One of our members was a retired Anglican canon, to whom I pointed out the Bradford Cathedral choir CDs on sale, and remarked that Vicars was run by vicars. He replied that it’s possible to do a great deal to further the Gospel without preaching. More recently, I’ve taken my Humber Heritage tour group to Holy Trinity Parish Church, Hull, shortly to be redesignated Hull Minster and the subject of a radical reordering scheme which aims to bring members of the public, whether or not they embrace the Christian faith, into the building for all sorts of purposes: http://www.holytrinityhull.com/amazing-development. In the process, the church authorities wish to clear the nave of pews, returning it, as they say, to its medieval emptiness and flexibility. The Victorian Society objects to the scheme, and I can see their point. The beautiful, highly individual pews, carved by George Peck in the 1840s, are a huge cultural asset and deserve to be kept, or at least kept together. I haven’t the remotest clue how to resolve this conflict, because I support the conservationist principles of our major amenity societies at the same time that I’m concerned to see the Church of England find useful purposes for its stock of beautiful buildings and their contents. And I hope Peck’s pews remain intact. The cakes at Café Trinity in the south choir aisle are heavenly: http://www.holytrinityhull.com/cafe. Update: The pews are coming out, to be truncated and returned in a state that makes them removable: http://www.dailymail.co.uk/news/article-4233202/Britain-s-largest-parish-church-removes-pews-concerts.html and http://www.hulldailymail.co.uk/houlton-starts-stripping-out-victorian-pews-in-hull-s-holy-trinity-church/story-30132370-detail/story.html. This entry was posted in Humber Heritage, Sacred Places, Victorian Architecture on November 4, 2016 by Mike Higginbottom.